« Welcome to Curly Quills! Through the stress of this past week, with Christmas being less than a week away, and my birthday in the same area, things have been busy! 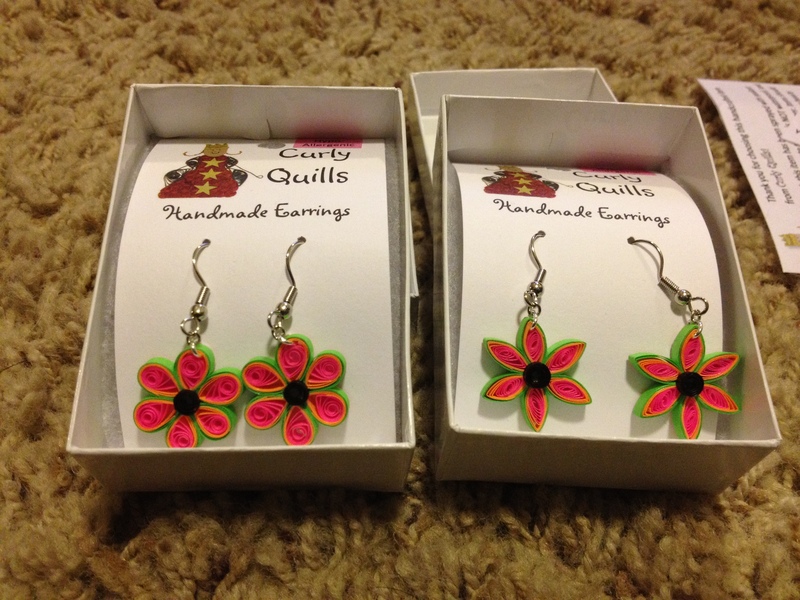 I received a custom order from a family friend for a pair of quilled flower earrings for a Secret Santa at work. She said she wanted them bright and colorful, but they also had to be hypo-allergenic. Through my searches, I found that in my town, only Hobby Lobby sells hypo-allergenic ear wires, and they happened to be on sale the week I was looking for them, and they happened to be sold out. Woo! I did manage to get them, and asked her if pink and orange would be good for the earrings. She agreed, so I began my crafting. However, when I pulled out the pink and orange, the brightest I had, Something just wasn’t right. It needed something else. So I looked through my binder of paper, and found some green. I thought they went together perfectly. I quilled them, shaped them in to flowers, and sent her a picture before I sealed them and added the jewelry findings. She thought they were perfect. I forgot to mention that I didn’t know if she would want a rounded petal shaped flower, or a pointed petal shape flower, so I made a pair of both. She said she would love to have both pairs. So here they are, in all their bright, colorful, and hypo-allergenic goodness. I call them Rainbow Sherbert.